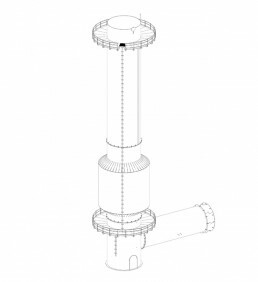 Purenviro provides chimneys for flue gas, odor and emissions to air. We supply complete projects including engineering, bases, production, installation and commissioning. When do you chose a chimney? Chimneys should be part of the overall strategy to minimise the impact of emissions to air. No abatement techniques can provide 100% efficiency. Teh remaining emissions should be diluted in chimneys to avoid nuisance. Chimneys are part of the BAT (best available technique) for most industry sectors. 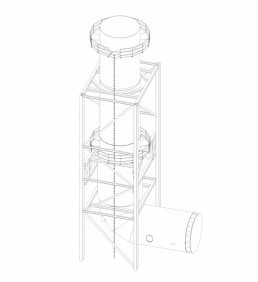 Flue gas and smoke for facility boliers and energy plants normally require dispersion from chimneys. Chimneys are used to disperse flue gas from bio energy plants. CPH plants running on biogas, pellets, oil, coal or gas will require chimneys for final flue gas treatment. We supply chimneys with capasities up to 400.000 m3/h, temperatures up to 550oC and gas velocities of 25 m/s. All our chimneys are produced by SSM. This standard version is a sectional flanged steel stack – shell in Corten or S235 painted – with a diameter up to 3 m.
EN 1993-3-2: Towers, masts and chimneys – Chimneys. EN ISO 14122-3: Working platforms and walkways. This standard version is a sectional flanged steel stack – shell in Corten or S235 painted – with a diameter up to 5 m. Exhaust pipe for flue gas SS 4541 or similar. For this product line, there is a limit of approx. 400,000 m3/H at 25 m/sec with 1 partly inner liner. This product line consists of stacks for turbines in supporting steel racks with built-in silencers in the 2nd stack section and a maximum temperature of approx. 550 °C for flue gas. 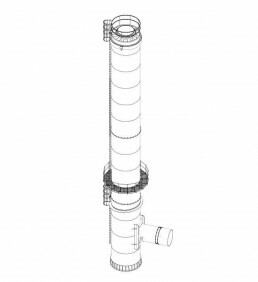 EN 13084-1: Free-standing chimneys – General requirements. EN 1993-3-2: Security class – if nothing is specified, it will be designed in accordance with EXC 2. EN ISO 14122-1: Safety of machinery. Dismounting and demolition of existing 65 M Corten steel stack, inspection of existing foundation and design, manufacturing and erection of new steel stack with 3 innerliners for exhaust gas from 2 for oil boilers and 1 for pellets boiler. We delivered and mounted all fluegass pipes for Borup New Bio Plant in Denmark. A new plant which solid fuel is bundles of straw. Delivery and installation of a 30 m and a 12 m steel chimney. Installation of 3 new 70 m acidproof cores and 3 exhaust silencers. In existing concrete shel. Delivery and installation of a 9 m and a 20 m steel chimney. Delivery and installation of a 62,5 m and a 41 m steelstack in corten. Delivery and installation of 2 x 31 m steel chimneys. Delivery and installation of a 75 m steel stack with 4 cores for a coal-fired heating plant. Delivery and installation of 24 m steel chimney. Delivery and installation of a 27 m steel chimney for antennas. Delivery and installation of two 43 m steel chimneys. Delivery and installation of an 18 m steel chimney for Wittmund Biogasanlæg GmbH (Wittmund Biogas Plant). Delivery and installation of a 35 m steel chimney for Skanska, Vällstaverken, Upplands Väsby (Recycling Plant). Surface treatment of a 76 m steel chimney as well as putting in 3 new stainless steel acid-proof cores at Kongens Vænge, Hillerød. Delivery and installation of a 17 m chimney with 3 acid-proof stainless steel cores. Tearing down brick core in 60 m concrete chimney. Repairing the concrete shaft and surface treatment. Delivery of a 47 m steel chimney to Nestle Bang Poo, Thailand. Painting of a 40 m brick chimney. 120 m concrete chimney. Renovation of concrete shaft and partly replacing walled up core (120,000 bricks). Rebuilding channels, adding mufflers and repairing a 60 m brick chimney. Delivery and installation of a 60 m steel chimney. 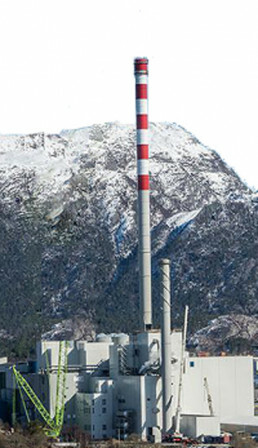 The Chimney at Longyarbyen Energiverk consists of a 90 M reinforced concrete windshield with 2 independent steel flue liners within its annular space. Delivery and installation of 5 steel cores in a 90 m concrete chimney. Sliding of a 75 m concrete chimney and putting in steel cores. Product: Delivery and installation of 3 steel cores in a 94 m steel chimney. Delivery and installation of a 40 m steel chimney to Simonds Farsons Cisk Ltd. Delivery and installation of 60 m steel chimney with 5 cores. Delivery and installation of a 30 m steel chimney. Delivery and installation of a 75.5 m steel chimney with glasfiber innerliner for incineration plant. Delivery and installation of a 58 m steel chimney with 1 core. Delivery and installation of a 67 m steel chimney for University Hospital Akershus. Delivery and installation of a 57 m steel chimney with 2 cores. Delivery and installation of 4 steel cores in a 30 m brick chimney as well as antennas on Gardermoen. Delivery and installation of a 55 m and a 39 m steel chimney with acid-proof stainless steel cores. Delivery and installation of a 72 m steel chimney and a 65 m steel chimney. Delivery and installation of a 70 m steel chimney and channels. Walling up a 150 m acid-proof core ø 4000 mm in concrete chimney. Delivery and installation of a 44 m steel chimney. Sliding of 150 m concrete chimney as well as walling up acid-proof core ø 4000 mm. Delivery and installation of a 30 m steel chimney for antennas. Delivery and installation of a stainless steel core in a 70 m concrete chimney. Rebuilding of 5 x 35 m steel chimneys. Delivery and installation of a 37 m steel chimney and channel. Delivery and installation of a 33 m steel chimney with 3 cores and exhaust silencers. Surface treatment of a 70 m steel chimney as well as putting in 3 new acid-proof stainless steel cores at Kirsebær Allé, Ullerød. Delivery and installation of a 55 m steel chimney and channels. Sliding of a 70 m concrete chimney ø 3600 mm. Renovation of a 60 m steel chimney with new stainless steel acid-proof core and dolmen. Delivery and installation of a steel core ø 5000 mm and galleries in 235 m concrete chimney. Delivery and installation of a 50 m steel chimney as well as casting the foundation. Walling up a 115 m acid-proof core ø 4600 mm in concrete chimney. Delivery and installation of 2 x 28 m steel chimneys for Biogen Idec, Hillerød. Tjæreborg Industri A/S. 40 m steel chimney. Delivery and installation of a 117 m steelstack with a diameter of 4,7 m.
Product: Darguner Brewery. 2 x 16 m steel chimneys.